Our family used to play a lot more board games during gatherings than we do now. My grandparents lived only 10 miles away from us so we visited with them nearly every weekend and sometimes during the week, too. I remember playing quite a few games with them, especially during the winter months. Rummy Royal was one of my favorites. I conducted a brief search online to see if you can buy the game now. Unfortunately, it looks like it is possibly out of print, but vintage games are available for purchase. Interesting fact I dug up - it looks like the game we played was produced by Whitman Publishing Company out of Racine, Wisconsin! So close to home. Apparently there are alternate names for the game, too, including Tripoley, Rummoli, Poch, Calliente and Michigan Rummy. Looks like you might be able to purchase the game under the Tripoley name. (See http://new.timetoplaymag.com/gamenight/) Anyway, my grandparents still have Rummy Royal game, but it has been awhile since we've played. 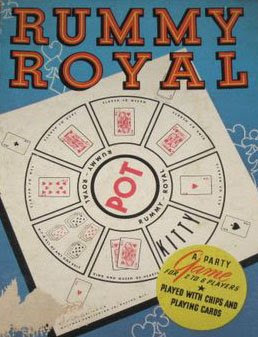 Rummy Royal is a card game that uses poker chips and a large playing mat about the size of a folding table top. Chips are placed on the mat. Cards are dealt, with one extra hand reserved. I learned basic poker hands from playing the game because the game starts out by betting on your poker hand. Winner gets the pot. The board game commences by playing cards in a sequential order and picking up corresponding chips off the board. First player to run out of cards wins and gets the "kitty". There isn't too much strategy involved in the game, so it works great with kids. Lots of counting of chips involved, too. Anyway, I always had fun playing it and so did my brother, though I did get a little sad if I ran out of chips and lost! Tomorrow night, (2/27/08) participate in the #timetoplay SiteWarming Party for Time to Play on Twitter. See here for more details. Looks like a fun time, just like a family game night! What great memories! We were a game-playing family growing up, too, so I'm really trying to keep it going with my kids. Isn't it cool when the grandparents live close by? My MIL lived 2 blocks away & was always here for the my girls. I live about 15 min. from my DD26 so I see my grandkiddos all the time! My MIL taught my girls to play Rummy!